The interactive exhibits for the Accessible Steam Heritage (ASH) Project are in the final phase of construction. In May, the exhibition team attended a mid-point review at the AIVAF workshop in Sheffield to look at progress. It was exciting to see the ideas come to life. The "Stepney" driving experience--in which visitors will try driving a mock-"Stepney" down our track, as represented by film through the porthole windows--will include a cross-section of the boiler with moving lights to indicate the presence and movement of water, heat, and steam. Other interactives will give visitors the opportunity to learn about some of the science and history behind steam. Platforms between roads at the north end of the shed--to allow for better access and the opportunity to visit the footplate of No. 75027--are due to be installed by mid-July. Heritage painters have done a wonderful job of cosmetically restoring No. 75027, which was positively gleaming in the sunshine when it was removed from the loco works (as seen in the photo at right). A new smart entrance to the running shed is now complete and finished with matching doors in keeping with the building. The brickwork, too, matches the exterior brickwork, and it looks great. The original windows also have been replaced, which completes the finish. 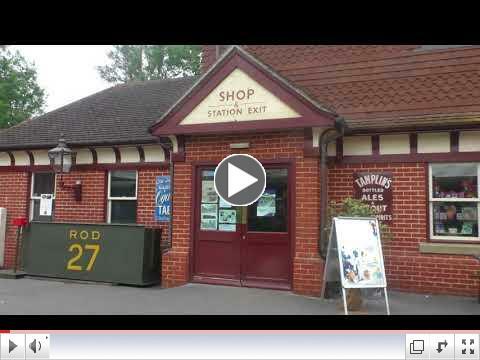 FOSP Update: Farewell to the Bessemer Arms Canopy Job! We have finally declared the Bessemer canopy complete. The final act was to commission the new lighting two days ago, and we shall have a small formal opening ceremony next week (no-doubt the subject of a future news piece). So we must now turn our Friends of Sheffield Park (FOSP) minds (or mind ... we are a solid team after all!) to the many smaller tasks around Sheffield Park that have been inevitably neglected whilst we were focused so heavily on our latest magnum opus. But not so fast ... no sooner had we cleaned our paint brushes and sat down in the lobby to reflect on life post-canopy than we were "approached with an opportunity" to become responsible for the finishing of the long-overdue AWF fit-out (AWF stands for "Above Workshop Facility", which is the newly developed staff and office area upstairs in the loco shed). Unlike other possible options, our resource is, of course, free of charge to the Railway, and we have responded positively to the appeal, which should see the AWF facilities finally completed for use and for only the incremental cost of materials. The down-side of course is that FOSP only works one day a week, so the actual time-scale may not be as short as everyone might like, but I can use that point to issue an appeal (or would it be a challenge?!) to anybody who might like to expedite progress. There is more than enough to do, and we can always accept offers of practical help. If you can paint a wall, or fix skirting, or have decent general DIY skills, then please feel free to come along and join us. We are to be found at Sheffield Park every Wednesday without fail (or you can contact me via the eNewsletter editor). The ASH project is also beckoning to us from a little distance, and we have agreed to become involved with that project to the extent of our capabilities. But I have cautioned against making us "critical-path" because it isn't reasonable for a part-time volunteer group to assume the pressure of a challenging finish date. So, back to those smaller tasks we have been neglecting. I have been surveying the whole station area and building a long list of the many items requiring our attention. The idea is to have a simple check-list so that all our FOSP members can see the work before us--large and small--and maybe even select an item they may wish to take ownership of. Also, if any readers have a particular idea, or see something that would benefit from our attention, then please get in touch--we are always open to suggestions. Don't Forget to Sign Up for Track Trek! There will be a few changes to the annual sponsored Track Trek at the Bluebell Railway this year. The event has been moved from November to mid-summer, and it will now be held on the evening of 30 June, 2018. Organisers are hoping that this will bring brighter, warmer, and drier weather. Also, instead of the whole line, the walk this year will start at Horsted Keynes at 6 p.m. and cover the five miles to Sheffield Park. Arrangements are being made for free transport of all walkers, by train, back to their original arrival point at the Railway. Money raised will go towards track replacement work on the Sheffield Park to Horsted Keynes section. More details here . To add to your visit to the Railway, remember that it's a relatively short walk from the Sheffield Park station to one of the finest National Trust properties in the country. Enter Sheffield Park & Garden via a back entrance adjacent to the river bridge near the Railway's car park entrance. Keith Duke's photo below shows the garden in all its early summer glory. Enjoy this gallery of photos from April's East Grinstead Vintage Bus Day, by Martin Lawrence. 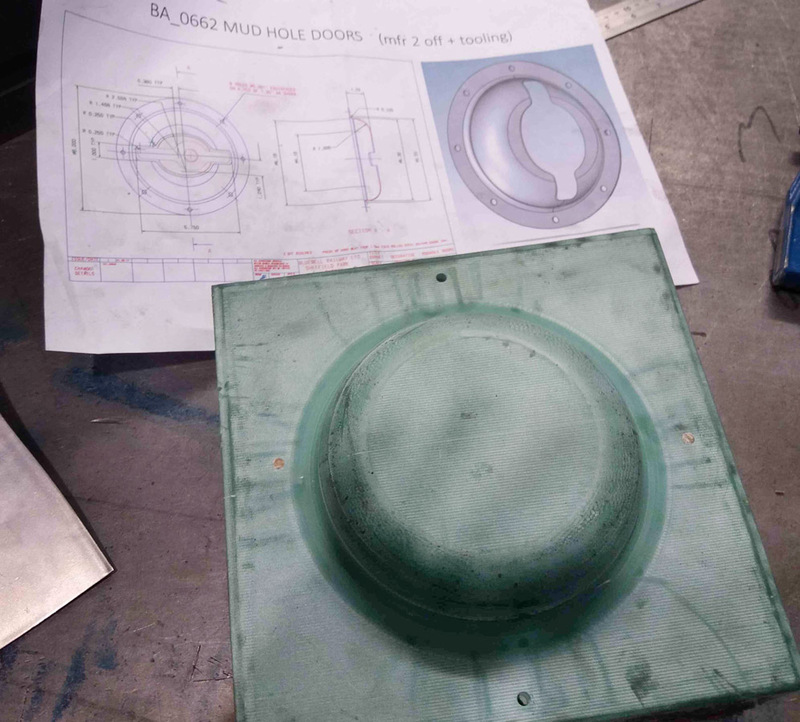 Plastic tooling for mudhole door surrounds (photo by S. Burdett, The Premier Group). As no doubt you have seen in previous updates, we are reasonably comfortable with the machining of components, and the fabrication of heavy lumps of metal, but when it comes to the thinner sheet metal required for the details related to the boiler clothing sheets, then we are into a specialist area. I have spent quite some time trying to find a company to make such items as the decorative mud hole door surrounds, the mouldings that fit to the boiler clothing but cover in the front corners of the firebox, plus that which encircles the backhead. Also we need a proper outer dome cover and some other parts that will not be seen (very unfortunately), these being the pockets that are inside the boiler clothing where the latter is cut away to clear the tops of the driving wheel splashers. Also we needed that company to have the capacity and capability to do this work at a sensible price. This work is far from being mass produced body panels and involves a mix of pressing onto simple tooling followed by skilled handwork for final forming and finishing. Fred Bailey of the Bluebell Railway Atlantic team has kindly converted the existing BR drawings to modern CAD computer files to enable the manufacture of single-use patterns for the required cylinder covers unique to the Standard Class 5MTs. An order has been placed for manufacture of these castings and, once cast, they will receive final machining as soon as possible. Also required are new piston head castings and these are currently on order. Due to the complexity of the repairs required we are unable to give a "return to steam" date for the locomotive, but updates will be made to this page as work progresses. The photo shows a view inside the cylinder block which is not normally available. It gives a reminder of the precision and specialised level of expertise required to carry out repair work on these ageing locomotives. Unfortunately, No. 60163 "Tornado" will not be able to visit us in August as we had hoped. All customers with bookings for the original visit dates in May, and any who transferred to the proposed alternative dates in August, will be contacted by our Customer Service Team as soon as possible. 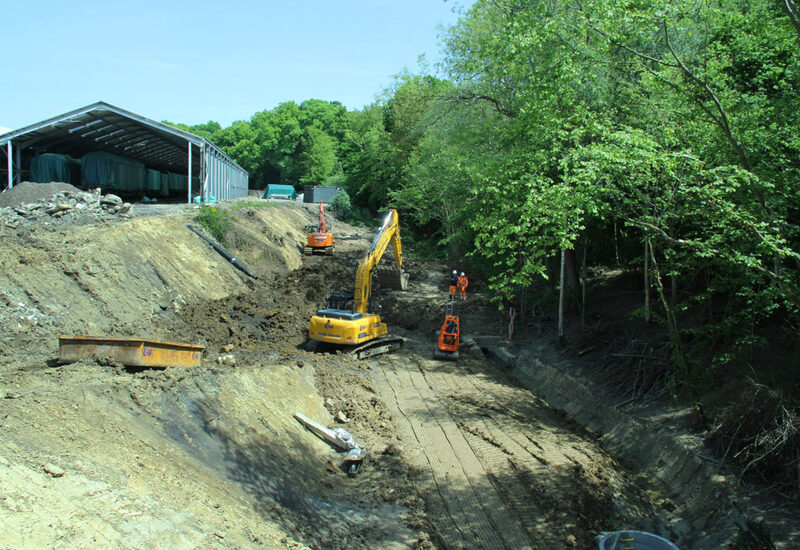 This photo from OP4 Project Manager Barry Luck, taken in late May, shows progress on the earthworks at Horsted Keynes. "We have dug out the loose uncompacted material in the embankment down to the original ground level, and we are now rebuilding the embankment layer by layer, interleaved with geo-tech mesh, compacting each layer before placing the next." The locomotive workshop is open seven days per week and is seeking a skilled engineer to join the team to carry out the maintenance, overhaul, and repair of the railway's historic collection of steam locomotives. The applicant must have either completed an engineering apprenticeship or have other equivalent qualifications. Skills essential for this post include machining and fitting mechanical parts with demonstrable competence in the use of manual operated lathes and milling machines. To view all current vacancies, click here . "I think we (we being No. 3417's Loyal Minions) have mentioned before that this railway preservation lark isn't all about glamour, girls, and riches beyond the dreams of avarice. Some of it is dirty and boring and bloody hard graft. Last Sunday's work day was a fine example of this point; a lot of dirt and heavy lifting punctuated by mild swearing and tea. The work crew consisted of yours truly and Darren and the task was very simple: tidy up the shed. Of course, before we started work there are certain things that have to be seen to, and Depot Operating Procedure Section 4, subsection 6 was duly dealt with on arrival. This morning the SETG will be moving 4 EE507 traction motors, previously donated by Porterbrook Leasing , from Wimbledon Park to Strawberry Hill as part of our on-going plan to concentrate our spares pool in one location. We would like to thank South Western Railway for their assistance at Wimbledon and to thank Castle Scaffolding for donating their equipment and time to help us in the move. NOTE: TrackFest (16 June) has been cancelled. All events listed here . On 11-12 Aug. 2018, travel through 100 years of history in one day! This new event will bring different eras from history to life with a different decade recreated at each station. The London Brighton & South Coast Railway, from which the Bluebell Railway evolved, began life in the 1840s, and it is the Victorian Era that Sheffield Park will depict. Horsted Keynes Station will give a flavour of life during the 1940s war years, while Kingscote will become "Kingscote-on-Sea," recreating the classic seaside holiday. Travel tickets are valid all day so hop on and off the trains to explore each station as much as you like throughout the day. Richard was born on the 1st October 1885, in Hailsham. As a 19-year old he enlisted into the 3rd Battalion Royal Sussex Regiment on 23 Oct., 1904. At the time of the 1911 census he was serving out in India (Rawalpindi). After seven years service he was transferred to the Army Reserve. He joined the LB&SCR on 27 May, 1913, at Kingscote as a Porter (Signalman) under the tutelage of Station Master Herbert Pemberthy. Just a year later on the 8 May, 1914, he is transferred as a Porter (Signalman) to Sheffield Park (George Reddish, Station Master). On the 6 Aug., 1914, he was mobilised for military service joining the 2nd Battalion Royal Sussex Regiment (service number 8124) with the rank of Private. After initial training he is posted for service in France on 27 Aug., 1914. He sustains an enemy shrapnel injury to his right knee on 10 Sept., 1914, and is treated in a Field Hospital and returned to England. After periods serving with the Regimental HQ and a spell with the 3rd Battalion, he is promoted to Lance Corporal on 19 Oct., 1915. He is posted back to the 2nd Battalion on 28 June, 1916, and is promoted to Corporal on 12 July, 1916 ... MORE . British Railways Wagon B904134 is a low machinery-carrying wagon known by the codename "Lowmac MU". With a wheelbase of 25 feet 6 inches, it has a low centre deck (only 15.25 inches above rail level and 15 feet long) with ramps at both ends. This design enabled heavy equipment with wheels or tracks to be loaded over the ends and to be carried within the height limit, known in the railway industry as "loading gauge". Designed for revenue (commercial) traffic, typical loads were an earth mover, road roller, or small lorry. B904134 was built to BR diagram 2/250, the last one of a lot of 12 (lot No. 2976) built at Swindon Works in 1957. It is fitted with vacuum braking, reflecting the contemporary policy of British Railways. area from the John J. Smith collection. No. 32678 at Robertsbridge with part of set 389, taken on 14 Sept.
From Martin Lawrence's May 2018 gallery, Roland, Jim, and Ali with No. 30541 at East Grinstead. 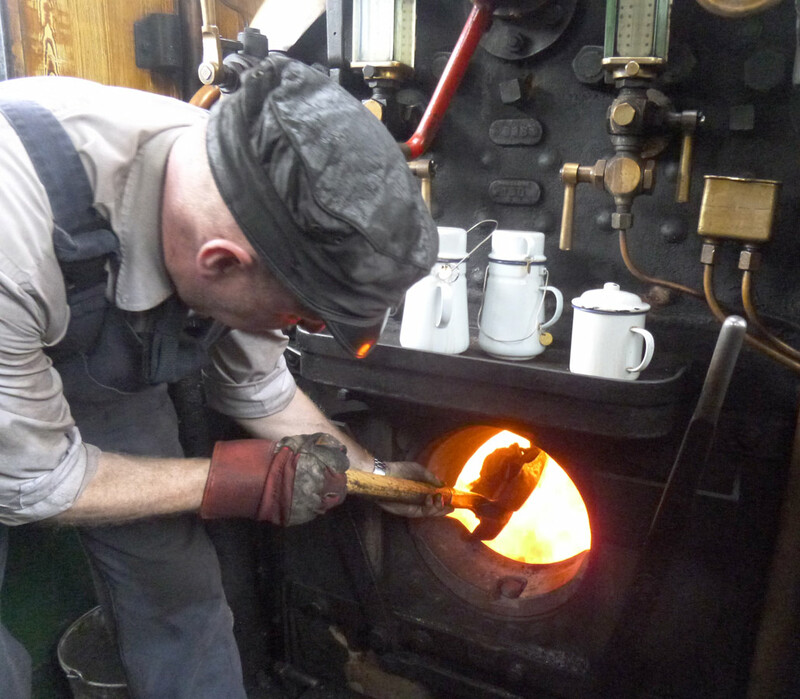 Greg Wales' photo , taken on the footplate of the H class on Saturday during his "third man" turn, show Nick firing. Derek Hayward's recent images show progress with the OP4 Shed Project at Horsted Keynes. John Sandys (5 June, 2018): "An unscheduled visit saw the Q class on Service One duty with more work continuing at Horsted Keynes and on the Ash Project at Sheffield Park." Mike Anton's 360° photographic views of the Railway have proved popular. We'll pick some of our favourites from time-to-time and share them with you, with a link back to Mike's site, 360cities.net/profile/mikeanton . If you wish to safely unsubscribe to this eNewsletter, please click on the link in the email's footer. NOTE: Once you unsubscribe, only you can add yourself again to our mailing list. John Hardwood: The GWR tank and Q class doubled head with H class pulling "Fingall" depart East Grinstead. 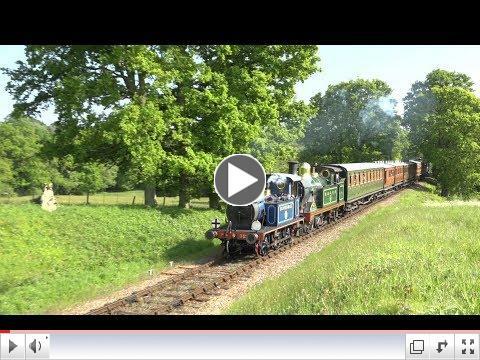 John Harwood: "Horsted Keynes-to-Sheffield park return. Plus, the weed killing unit; the unique Stroudley half partition 3rd Brake No. 949 (thank you C&W); progress on the new engine shed; the old Bluebell Halt; the Tremaines crossing; Three Arch Bridge; and OP4 works trackside". The Golden Arrow Facebook page has published the service's June menu . A track system using a concrete base mounted on rubber pads to reduce vibration transmitted to adjacent property. A number of railways have tried it with some anecdotal evidence suggesting that the maintenance costs are high and that riding quality of trains suffers. 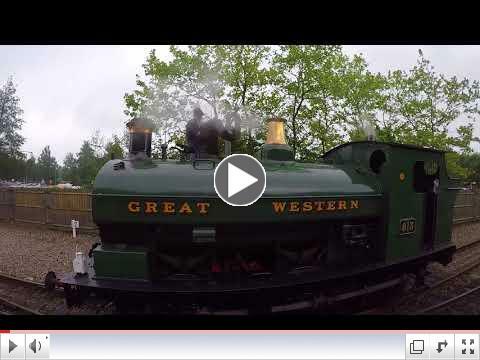 Video by Bob Kershaw: "A Branch Line Gala with a difference: Five locos operating an intensive service of shorter trains with an 'all change' theme." The first Chinese-built railway, the enthusiast trying to save it and his hero, the "father of China's railroad "
A steam train service is set to return to the Borders Railway this summer. The Locomotive Duty Roster has plans for locomotive usage through June and shows that the Q class will be hauling a Demonstration Goods Train on the morning of 17 June, 2018. A whistle-stop venture from Kings Lynn to Hunstanton via rail, in the company of Chib Thorp, amateur filmmaker and rail enthusiast from Leigh on Sea. From the RR Pictures Archive: Watering "Earl of Merioneth"
Project 27's new fundraiser T-shirt is now in stock. It will be available at the Model Railway Weekend on 23-24 June, 2018, and other events during the year.They are available in L and XL, with other sizes available to order at a cost of £12 each (plus postage if ordered by post/email). 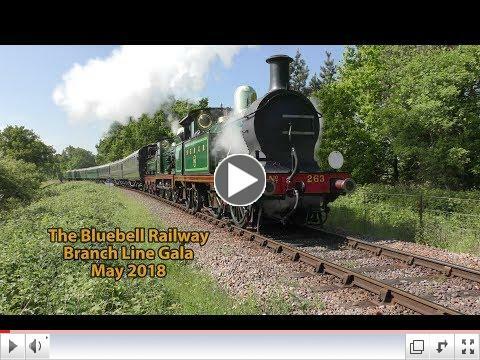 Derek Spicer's video from Branch Line Weekend (19 May, 2018). We help to mitigate risk of pollution and water course contamination by removing oily water, sludge and silt from interceptors. Here are our operatives @bluebellrailway Sheffield Park station near Uckfield. RS1- Weedfree's Railway Weed Control System has been at work on the @bluebellrailway today. @MADIdeasLtd Jun 5 We were truly honoured to undertake the rebrand for the iconic @bluebellrailway in Sussex as they approach their 60th anniversary. The historic working steam railway has featured in numerous films & TV shows including #DowntonAbbey #TheRailwayChildren and #PaddingtonBear2! Thanks @bluebellrailway for a wonderful day out with the kids. So much to see for young children now with the elephant play van and the kids playground at Kingscote. The trains were pretty good too! Got a chance to quickly test out the camera on my new iPhone 8 Plus while I was at the @bluebellrailway . Pretty impressed at the quality of this shot of 813 pulling into Sheffield Park! A new programme runs from today by At Home This Morning on @radioreverb with items on @snailspacebh, @QSBooks, @SaltdeanLido and @bluebellrailway's Atlantic project.